We may have been warned against judging a book by its cover, but, let’s face it, most of us do. . .at least to some degree. 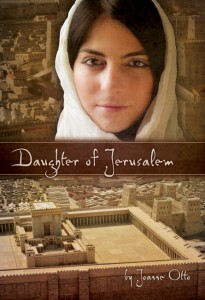 So the visual dimension of “Daughter of Jerusalem” loomed large when it came time to select images for the cover that would introduce it to potential readers. The images of first-century Jerusalem, especially of the Temple, were not difficult to locate. But finding the face that would represent our heroine, Mara, was another matter. At first I thought all I’d need to do was a Google search for “young woman with head scarf.” Surely a few intelligent-looking, reasonably attractive young women would turn up. But I found myself on stock-photo websites scrolling through cartoon figures, flirtatious hussies with come-hither looks, and sun-weathered candidates for National Geographic. Hundreds passed before my dazed eyes before one -just one – potential Mara finally turned up. And thanks to Meghan’s artistry, she now graces the cover of my book. Sometimes I wonder who she is and where she lives and whether she’ll ever know where her photo ended up. But to me, I guess she’ll always be Mara, the intelligent, spirited young daughter of Jerusalem. For over ten years after “The You-Song” first rolled off my pen, it remained simply a draft. I tweaked it from time to time and shared it with friends and family–including, of course, some children. But without the visual dimension, it obviously was not going reach the hearts and minds of its young audience. When our daughter Meghan Williams, a talented professional graphic designer, was working from her home, we began the online search for photos that would truly represent the kids “The You-Song” was all about. One by one, they found their way to just the right page of the book, leaping, smiling, laughing, dancing, hugging, writing, painting, swimming, swinging, reflecting, discovering. Just letting the beautiful songs they are ring out, they brought “The You-Song” to life. I don’t know their names, but somehow they feel to me like very loved friends. As a bibliophile married to another bibliophile, I can’t resist leaping into a discussion on our local book editor’s page on the subject of Kindle. Will it make books obsolete? Our modest condo is “nicely crammed” with over 5,000 books! Nevertheless, we are now experiencing our first Kindle read-aloud together, and there are things we actually like about it. Kindle is convenient, and it’s readable in most any lighting. But somehow reading a Kindle book still feels to us more like getting an email from a friend than having a real face-to-face visit. That being said, my preference for books as a reader has not prevented me from keeping both bases covered as an author. 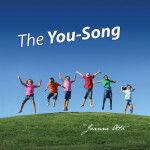 Even my children’s book, The You-Song, is available as an eBook, and Daughter of Jerusalem, my novella for middle grades, definitely had to be. They were written for a generation that’s as comfortable with screens as I am with paperbacks. And who knows where that could lead? So book editor Jane Henderson’s question remains open: Will books eventually become obsolete? Will shelved volumes seem as cumbersome to future generations as clay tablets or scrolls would to us? I shudder to think of it, but I know it’s possible. Yes, birthing a book would appear to be that—certainly the part that happens at the computer keyboard. But there is so much more to it—so many ways that others have contributed to bringing my books from the secret world of my imagination into public view. Without the encouragement, artistic talent, technical knowledge, helpful mentoring, and insightful editing of others, neither The You-Song nor Daughter of Jerusalem would have seen the light of day. Now that they have been published, it will take many others, involved in less central but nevertheless important ways, to let the books’ potential audiences know that they’re available and worth reading. Until now I never would have imagined how much a “like” on the You-Song or Daughter of Jerusalem Facebook page or a brief review on Goodreads or the website of a bookseller such as Amazon or Barnes and Noble—actions that can be accomplished in a minute or two—could contribute to getting the word out. So my heart is already reaching out gratefully to anyone who’s willing to take a moment to participate in this simple way in the publication of these two books. It assures me again that I’m not alone! How does it feel to get your books published? To me it feels a lot like motherhood. No kidding. My books are my babies. And they have a life of their own. Like most mothers, I delighted in the early stages of their development. They often surprised me, as children do their parents, in the amazing process of becoming what they were meant to become. But they were still safe at home, still not fully formed, still able to be molded as further intuitions came. Then the day arrived when it was time to let them go. It’s remarkable how difficult that can be. I began to realize how much I’d enjoyed having them around as “young” unfinished projects, how much my sense of life-purpose had come to evolve around them. But the only way they could fulfill their purpose was for me to release them. So, of course, I did. And like every mother, I wish them well on their journey into the world and hope that they will meet up with some good friends along the way. I hope you will be one of them.